The Razor Company manufactures the best scooters worldwide. Different sizes of razor scooter chargers with diverse power options are available. 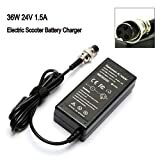 The question is; do you have the right charger for your scooter(s) battery? Well, the one you need should be a fast charger, easy to use and easy to get. Among the different chargers on the market, we identified the best razor electric scooter chargers for you, and we are certain that at least one will meet your requirements. It’s time for your battery to receive the charge within the needed time and allow you to make maximum use of your scooter. Is your Scooter e100/e125/e150? 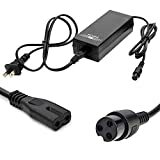 Well, get this amazing charger at an affordable price. This model is reliable as it restores your battery charge for three types of scooter batteries. This means that you can use one for three hence reliable. It is UL approved meaning that it will charge your battery consistently and within the required time of 8 hours. This is another high-quality charger by Razor. It’s ideal for over four types of scooter batteries making it the most efficient and reliable model on the market. The battery for the Razor e200, e300, PR200, Pocket Mod, Sports Mod, and Dirt Quad electric motors will only take 8 hours to be full. Again, this model is safe as its UL certified. 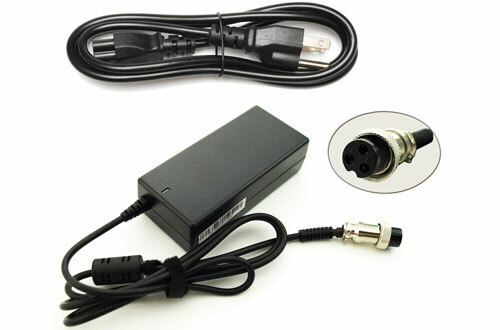 The input is AC100-120V 50/60Hz 1.2A while the Output is 24V 1500mA. 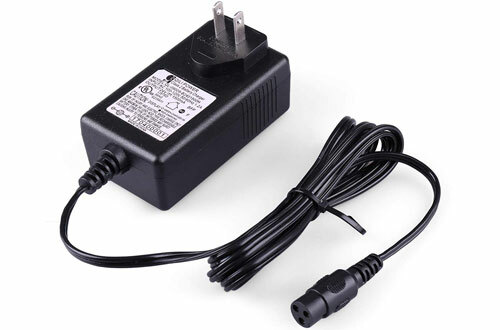 Input AC100-120V 50/60Hz 1.2A while the Output is 24V 1500mA. LotFancy is also a multi-charger ideal for various scooter batteries. You can use this model if your scooter is E100, E125, E150, E175, Power Core 100 Electric Scooter, Crazy Cart, e-Spark and Trikke E2. 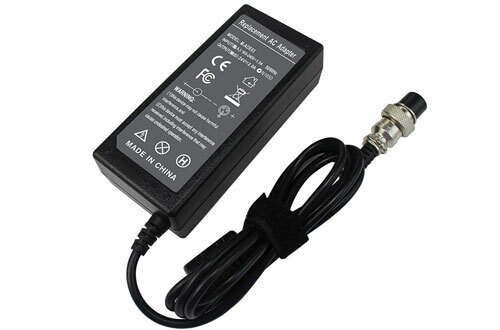 It has an input of AC 100 – 120V 50/60Hz and output of 24V 0.6A. When charging, you will know by the red light. When the indicator turns green, then your battery is fully charged. Its UL certified hence safe for your daily use. This is an awesome three prong inline connector ideal for the batteries of Pocket Mod, Sports Mod, and Dirt Quad. 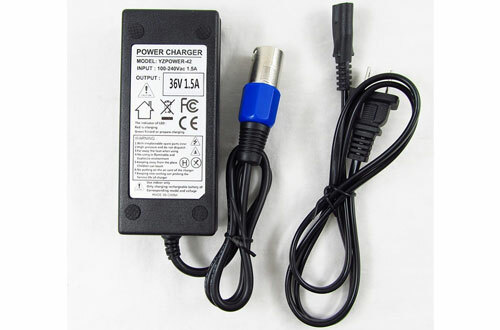 Its voltage input is 100-240VAC, 50/60Hz, 1.5A while the Output is 42V 2000mA. It’s also UL certified hence a great deal for your money. This model has an indicator that shows red when charging and green when full. You are advised to unplug when the charge is green to avoid overcharging and overheating. This is another three prongs inline battery connector ideal for those with Pocket Mod, Sports Mod, and Dirt Quad. 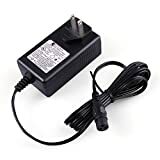 BestHot has an input voltage of 100-240VAC, 50/60Hz, 1.5A and an output of 42V 2A.its safe and features a short circuit voltage protection. The type has a red light for charging with a green indicator to show full charge. 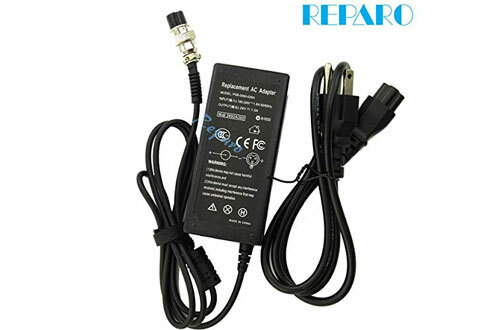 Reparo is ideal for many battery types. 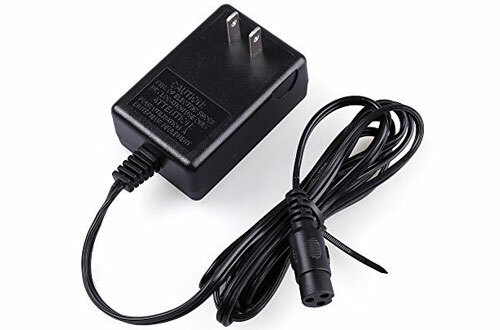 If your scooter model is E 100, E175, E 200, E 125, E 150, E500, Mini chopper, and Dirt Squad among others, then get this charger. 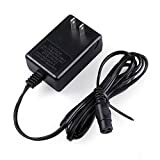 The input voltage is AC100-120V (50/60Hz) while the Output is DC 24V 1.5A, 36W.it also comes with a short circuit feature for protection against overheating and overcharging. The connector is female with three pin model hence ideal for various connecting ports. 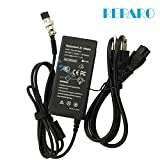 The Baturu is a battery charger ideal for Razor E100 E150 E200 E225S E300 E325S MX350 PR200 E500 S among other batteries. 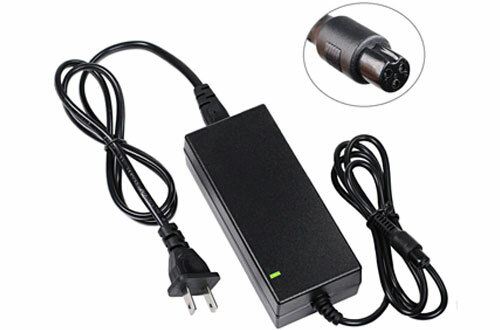 Its current flow is Output, DC 24V 2A 48W while the input is AC 100-240V 1.5A 50-60Hz DC. This makes it charge fast hence getting your scooter ready for riding. 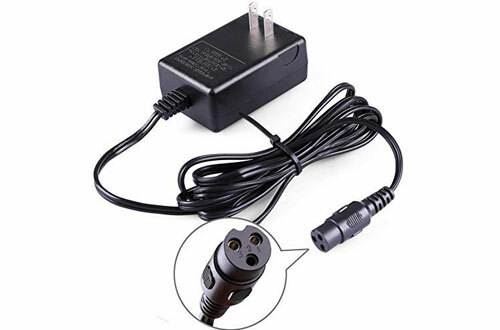 The connector is a three pin inline female connector.it comes with a 12-month warranty hence you can buy with confidence. The Abakoo comes for many barriers on the market. Some of the compatible scooter batteries include the GT GT750 Electric Scooter, IZIP I600 Electric Scooter, IZIP I750 Electric Scooter, IZIP I1000 Electric Scooter, and Mongoose M750 Electric Scooter among others. 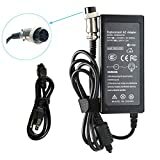 It uses the male three pin connector size hence reliable. Moreover, this model is a superfast charger that takes four to five hours for full charge. You will have a short wait time when compared to other models that take 8 hours. 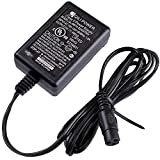 The input is AC 100-240V 50/60Hz while the output is DC 36V 1.5A 54W Max. This is our last best Razor scooter charger by Reo. 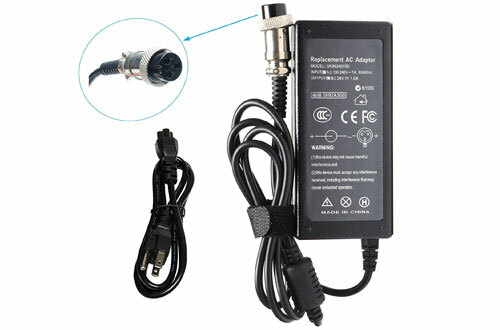 It operates on a voltage of Input: AC 100-240V (50/60Hz), Output: DC 24V 1.5A 1500mA, Max Power 36W. 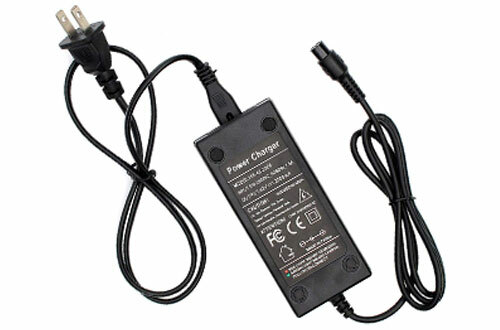 The high-quality charger has a connector tip which is a 3 –pin female model. It also has a protector and in that case, a circuit breaker that disconnects when overhanging or overheating. 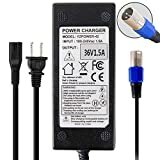 It’s ideal for the Charger for Razor E100 E300 E200 MX350 MX400 ZR350 E300S E200S E175 E150 E125 E500 E225S E325S E225 PR200.The type has a 12-month warranty just for you to buy with confidence. 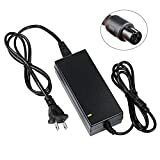 If you have a scooter and wondering how to secure a reliable charger, then worry no more. Our in-depth review has all your specific needs covered. Our selection of the ten best Razor Scooter Chargers are all result oriented, and you can now choose one for your daily charging requirements, and you will never get disappointed. Make the decision now.